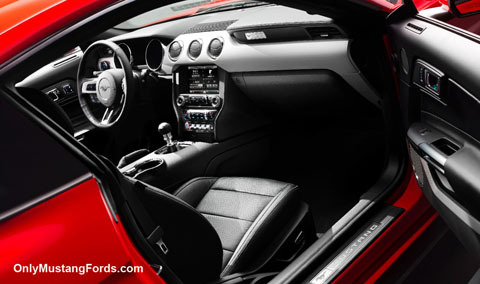 The 2015 Ford Mustang debut on December 5, 2013 finally lays to rest all the questions on the direction Ford chose to take with the all new pony car. For some of us, this Mustang's appearance is one model year late, but definitely worth the wait. If you've read our 2015 concept article and wondered if we were on the right track, I'm happy to say we are. 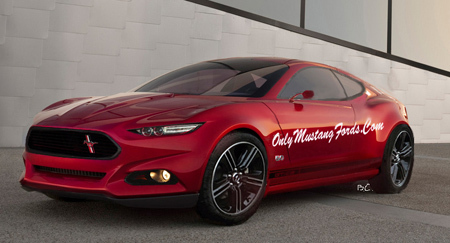 Here's the OnlyMustangFords.com 2015 Mustang concept car rendering compared to the new hot of the presses 2015 Ford Mustang. Following the release of the Mustang's official 2015 specifications and pictures we finally get to see what the boys and girls at Dearborn have been up to in secret for so long. The 2015 Ford Mustang debut brings the Fastback Back! With fresh styling changes, the new car is both, lower and wider, especially at the rear. The front A pillar has been moved back and the windshield raked backwards to make the pony car more aerodynamic and sleeker looking. And yes, Ford is calling the swooping rear rake and long rear window a fastback again. From certain angles, this new styling is somewhat reminiscent of a Jaguar or Maserati and the new, shorter nose taking on a more European stance, seen from the side. Life with the top down. Yes, the convertible ( S550 ) Ford Mustang will be available in the 2015 model. Styling cues from the 2005 and up cars abound, but the new car's interior appointments have been updated and made less blocky. The 2015 Mustang debut also finally sees Ford putting some work into providing better looking door panels. Previous models have always had a cheap looking plastic finish. An independent rear suspension is and will be a prominent new addition to the new pony car, raising its overall handling level and performance even higher. For the front end, there are significant changes that should make for a huge difference in both handling and road feel. 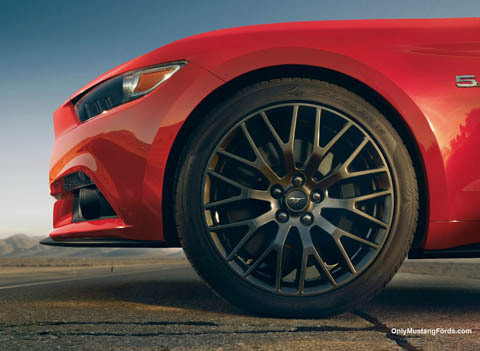 Ford calls it a double ball joint McPHerson strut suspension ( see the (2015 Mustang suspension changes article for more details). In addition to the aforementioned improvements unsprung weight is reduced, further improving response and handling capability. Ford's engineers have patterned the car's handling performance against the Boss 302, so you know this is no grocery getter in any version. A very powerful new 4 clyinder engine appears in, the new for 2015 Mustang debut in the form of a 2.3 liter turbocharged inline four cylinder Ecotec engine, that not only should propel it into the gas mileage leader in it's class, and provide even more power (305) than the six cylinder option and develop 300 lbs of torque, making it more powerful and more fuel efficient than the high tech V6 engine available for the 2014 model year. The 3.7 liter v6 engine, loses 5 horsepower, dropping it back to 300 horsepower and now produces only 270 lbs of torque (10 less than last year). Ford hasn't indicated why at this point, but it may be due to a smaller engine compartment and restrictions on intake and exhaust pieces. The big 5.0 liter Coyote V8 will continue to be the performance leader, pumping out a conservatively estimated 420 horsepower and almost 400 lbs/ft of torque. Ford typically under-rates horsepower on the big small block (see dyno results). 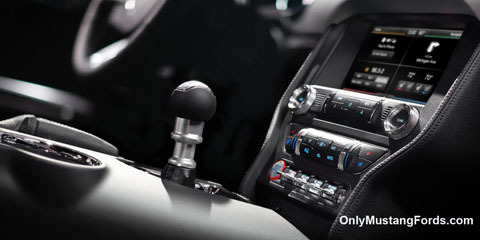 Like the 2014 Ford Mustang models, a manual an automatic 6 speed transmission is available on all engine choices. If you prefer your ponycar to shift most of the time but want some immediate action on those twisty corners, steering wheel mounted paddle shifters are now standard on all of the automatic cars. When Can You Order One? No word yet, but the 2015 Ford Mustang debut of the order guide could happen early in the new year. Stay tuned! 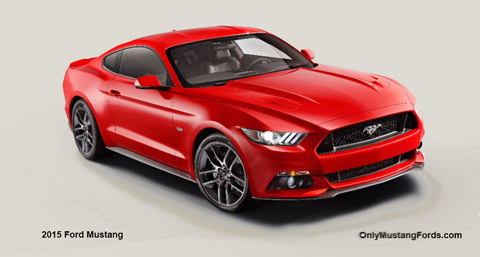 Return from 2015 Ford Mustang debut to the Mustang Home Page.